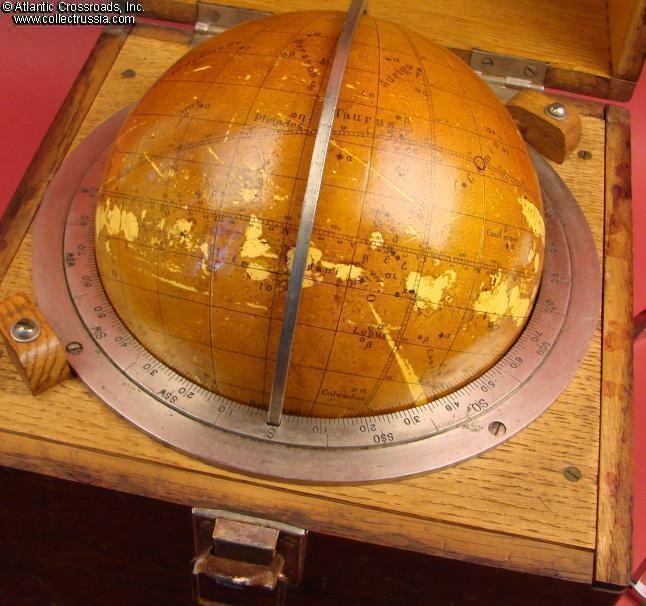 Soviet Navy Star Globe complete in original Wood Case of issue. 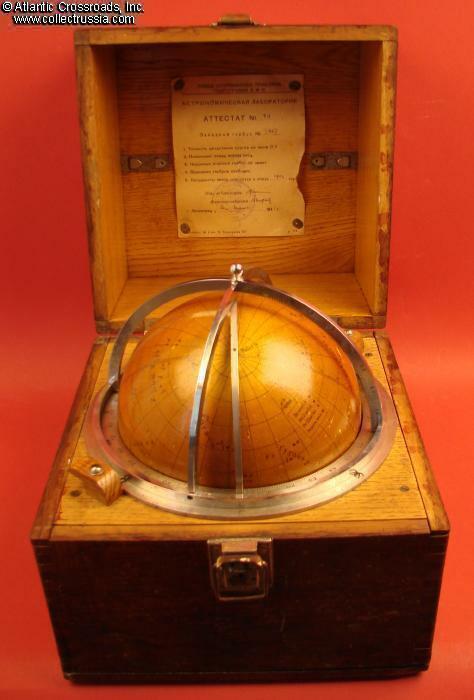 Soviet Navy Star Globe complete in original Wood Case of issue. 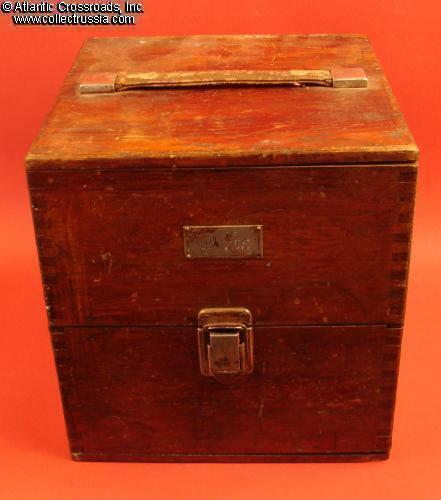 Complete with 1941 dated factory specification plate and 1943 dated calibration certificate in the inside lid. Overall in very good to excellent condition. 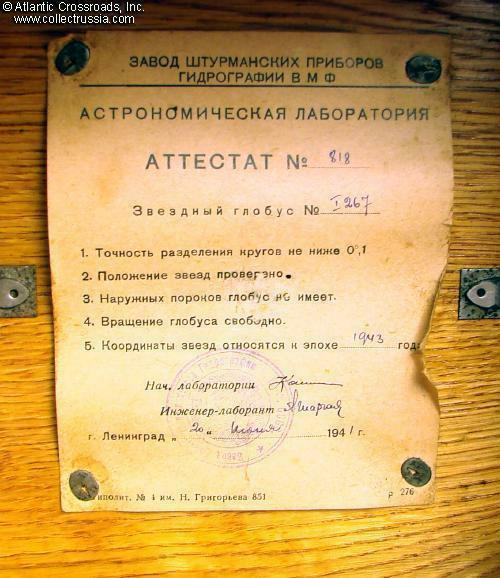 Classic navigational instrument as issued to Soviet submarines and surface ships for nighttime navigation. These were especially important on submarines as taking bearings would often be possible only at night when surfaced. 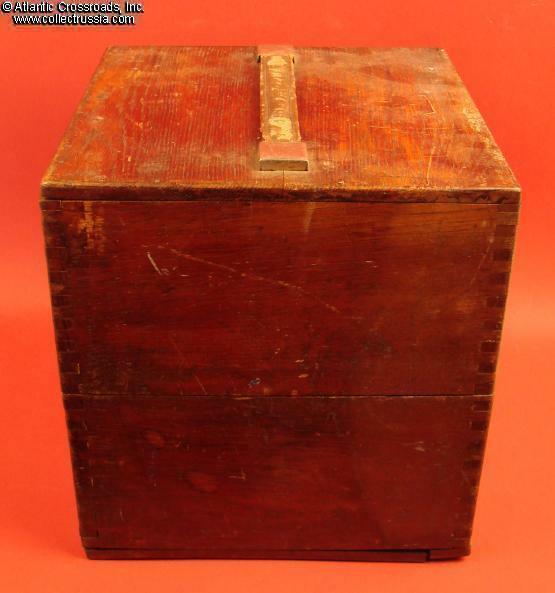 Very scarce and attractive naval item. 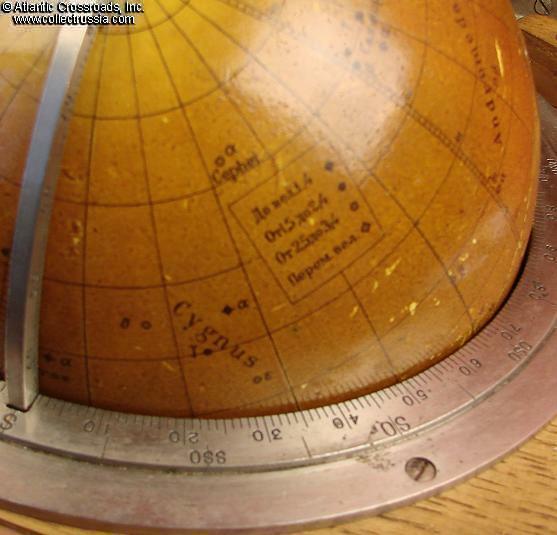 This Soviet issue piece displays all the typical features expected on a naval star globe of this era. 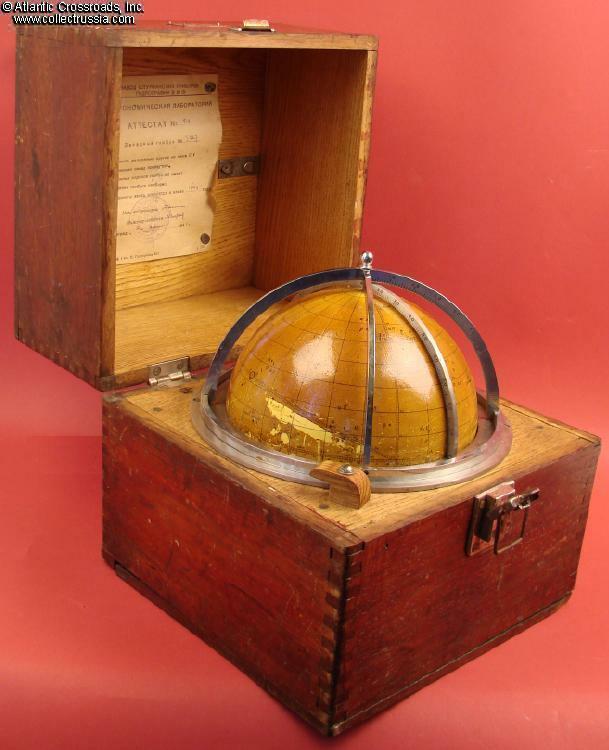 The globe is about 7" in diameter, covered in paper printed with the constellations and stars, and protected with a now-yellowed coat of varnish. The stars are marked in latin, the annotations are in Russian. The globe is suspended in a vertical metal ring with latitude calibrations, inset into a horizontal ring calibrated with compass degrees. A hemispherical marker divided into 4 quadrants rests on top. Condition of the globe is very good, showing the typical age yellowing to the paper and varnish. There are areas of surface wear which obliterate some of the markings underneath. This is limited to about 5% of the total surface, see our photos. The latitude ring which holds the globe originally had two very small screws, like pocket watch screws, which held the globe at the poles, only one remains. The wooden case is complete. It measures about 10" tall x 9" wide. Inside the lid, a 1943 dated specification card confirms its last calibration. 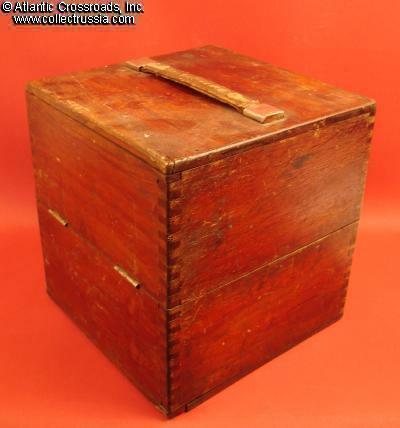 The wood is scuffed but retains most of its original varnish. Lid and bottom showing slight separation, but holding fine. The spring loaded carrying strap to the lid is solid and intact. 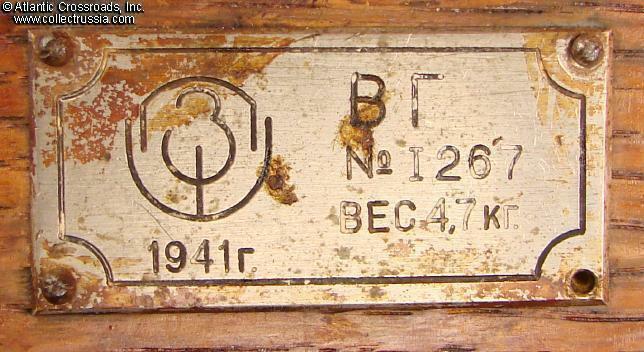 The metal nomelclature tag shows rust, as do the hinges and clasp. 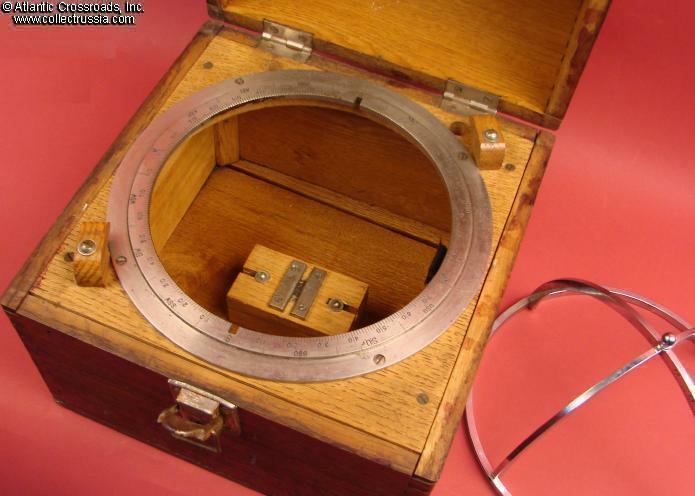 This navigation device was used by the submarine or ship's navigator, in conjunction with his sextant, to plot his position at night. 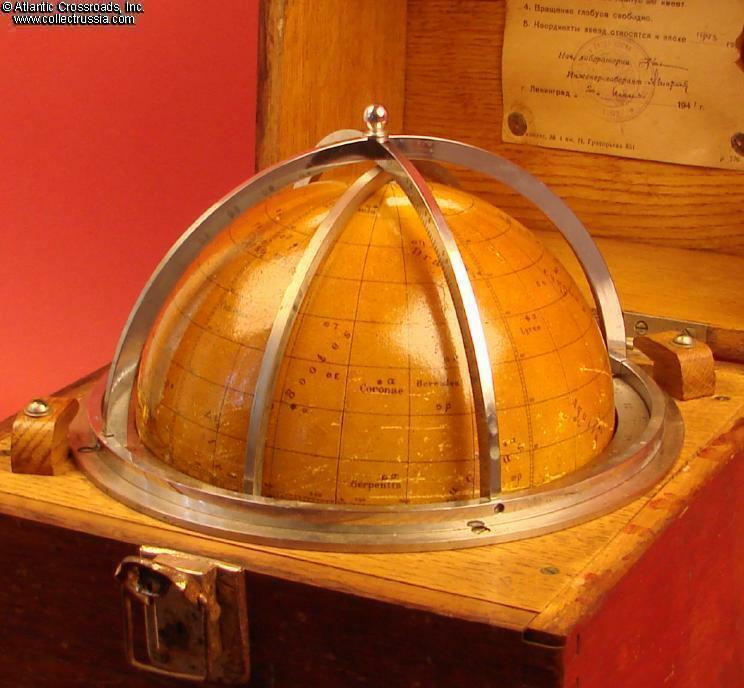 The origin of these globes date far back in maritime history and are highly sought after collector items. Soviet Naval gear from WW2 is always scarce, such a fine piece with an early date is an extrodinary and highly displayable artifact.